So if you’ve checked out the Farmer’s Almanac, you’ll see that there’s lots of precipitation ahead for us this winter. If you’re from the Midwest, you’ve probably even got your snow removal service on speed dial. It’s great to be prepared, and nothing can prepare you for heavy, unexpected snow fall like Warmzone’s radiant heated driveway solutions. 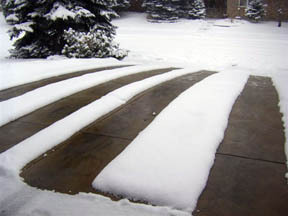 Radiant heat is one of the most efficient and reliable ways to remove snow from your driveway. The system utilizes sensors that can detect moisture and temperature conditions indicating snow and activate the radiant heat snow melting system before snow accumulates. Your driveway is clear before you ever leave your home in the morning. There’s no heavy shoveling, and no waiting on a snow removal service to come and dig you out. 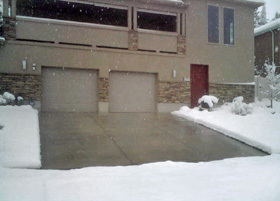 Why not spend a fraction of the money you’ll invest in snow removal services in a radiant heated driveway solution for your home? Warmzone provides flexible, snow melting solutions to fit your budget and specific requirements. And, once installed, the cost to melt snow on a 300-square-foot area is mere $0.50 per continuous hour of operation, and the time to melt snow off your driveway, per storm, is usually just a few hours, saving you time, money, and the hassle that comes with coordinating snow removal, whether you have a service or shovel yourself. Call 888.488.9276 today for more information. Sometimes what you can’t see will hurt you. This is especially true of black ice, or ice build-up under snow. Ice is not always visible until it’s too late. Fully automated devices are a standard component of all Warmzone ClearZone snowmelt systems. They detect precipitation and temperature, operating only when needed. With the help of sensors, they are able to detect moisture in the air coupled with low temperatures and turn the system on just before a snow storm hits for maximum performance. Warmzone radiant heat snow melting solutions keep driveways and walkways clear as conditions change, protecting your family from slip and fall injuries on icy steps, walkways and driveways. You could be reaping the benefits of a radiant heat snow melting system too. Now is the perfect time to install a radiant heated driveway. At this time of year, demand for professional radiant heat installation experts increase when the temperatures decrease, so act quickly and you stand to save big on your heated driveway. Call Warmzone to find a solution to your radiant heat needs, and a professional to help you with your installation at 888.488.9276.